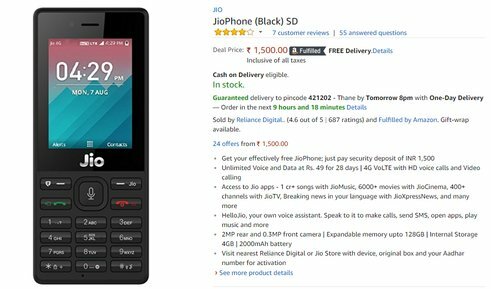 JioPhone, the 4G feature phone from Reliance Jio is now available on Amazon India website. The feature phone which was listed last month is now available to purchase. Reliance Digital will now be selling the Jio Phone officially available on Amazon India at Rs 1,500. The JioPhone features a 2.4-inch display and features a standard keyboard layout for input. It also sports a 2-megapixel rear camera and a 0.3-megapixel front camera for video calling. The device comes with 512MB RAM, 4GB internal storage and supports expandable storage up to 128GB via SD card slot. The smart feature phone comes with a native voice assistant but there is also Google Assistant for voice actions. The JioPhone runs on a customized version of Firefox OS called KaiOS and supports 22 regional languages. The feature phone also recently got the Facebook app, which makes it a truly smart feature phone. The JioPhone was launched in July last year at Rs 1,500. The amount is refundable after three years, making the effective price of the device as ‘zero’. So the Jio Phone can now be bought offline from a Jio or Reliance Digital Store and from three places online Amazon India, Mobikwik and Jio.com.